Finalised, that is, unless you can spot something that needs corrected! Many thanks to everyone who left a comment - there were some really good suggestions about how to improve the table. It's been a real community effort by The Online Darkroom readership. You'll maybe notice a couple of films that will most likely be new to you. They're Filmotech DP3 and Nik & Trick FT12, both available from NTphotoworks, a Kent-based company that has some interesting products. I'm hoping to pick up a roll or two for review purposes. The table above is just a jpeg - the real thing's below. That makes 66 b+w films available today? 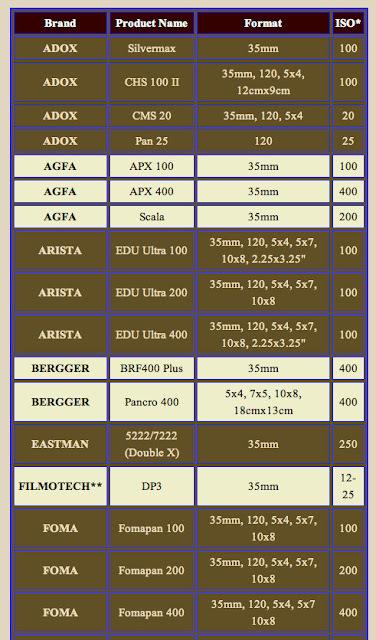 I guess the correct speeds fot Arista EDU can easily be figured, and will coresspond with to names.. The film table is looking good Bruce. Thanks for your help Nick! I am under the impression Neopan 400 is out of production. I am beyond certain Kodak C41 black and white film is out of production. Thanks for your hard work. Just one correction. I think you'll find that Foma Retropan 320 is not available in 120. Rollei ATO 2.1 available in 10x8, 9.5"x12", 12"x16" and 16"x20". Rollei Ortho available in 2.25"x3.25", 5"x7" and 12"x16". 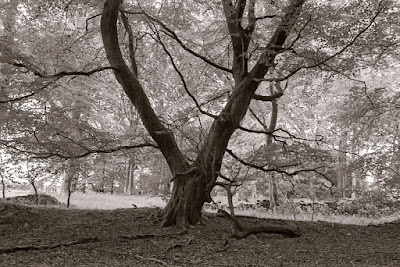 Pretty certain Fuji stopped making Neopan 400 a couple of years ago, more's the pity. There's certainly no new rolls here (Tokyo). As far as possible, I've listed films that are still available, i.e. can be bought somewhere, rather than just those that are still being made. No doubt quite a few of the films listed were produced a few years ago and now only exist in deep freeze storage somewhere but as long as they can still be picked up then I think they should be in the table. When stocks run out then I'll remove them. Please keep the articles coming btw, the site is a permanent fixture in my tabs.